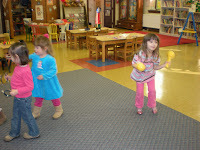 I have a group that just loves music and dancing. We play music at pretty much everyday during free time, it just brings the room to life. This group of children just love it. They dance and sing it's something to watch. 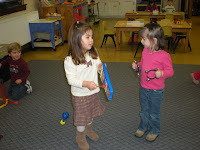 Today I decided to bring out our musical instruments so they could play their own music too. They had a grand time. I apologize for the pictures as photography is not my strong point. Some of them were blurry since I took them as the children were dancing around. Music is a great activity! 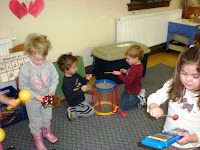 We play "band" on days that are rainy or too cold to go out. 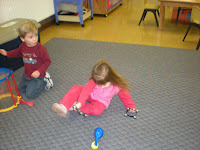 Gets the moving, and stimulates their brain!